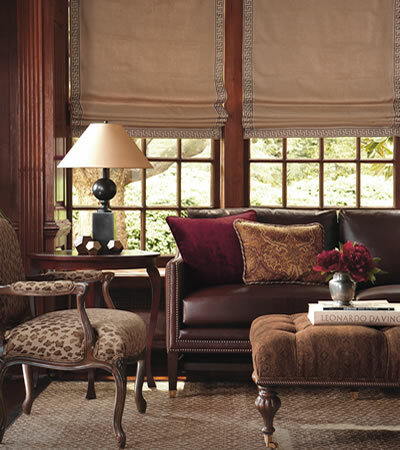 You like classic furnishings — but with an unexpected element, such as the leopard pattern fabric in the French chair frame. A Greek Key braid outlines the Roman shades to complement the view. The mix of textures — from leather to faux silk to paisley chenille to linen shades — make this handsome room one for the ages. Color you happy when you walk into this cheerful room! Vibrant colors from the garden will enhance your spirits and enliven your décor. Add bright accents to existing décor to give your rooms a fresh face. Dark walls create a dramatic backdrop for upholstered furniture in pale shades of platinum gray and yellow gold. The rich mix of fabric guarantees that this is contemporary, but not cold. 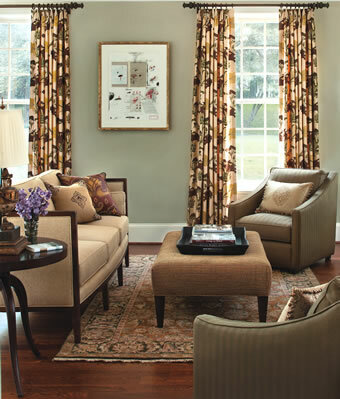 No naked windows here — silk draperies frame the view softly and beautifully. Distinctive furniture silhouettes are enhanced with low-key neutral fabric choices. Even sage green tone-on-tone stripes and a tweedy upholstery fit this description — neutral doesn't have to mean booooorring. If you prefer neutral furnishings, choose fabric textures for visual interest — and be sure to add a little pattern too, as in the silk drapery print and pillows. 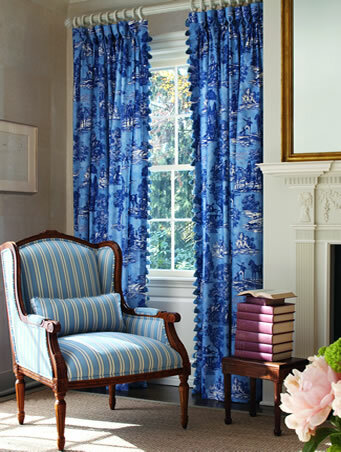 French bleu adds hue to this setting featuring a colorful toile and stripe on the chair — blues that don't match exactly, but marry beautifully. French country décor features pattern-on-pattern florals, toiles, small checks, plaids, stripes, matelassé textures and tapestries used in abundance. A white denim slipcovered loveseat adds a relaxed, summery feel to the furnishings in this room that are reminiscent of sand and sea. 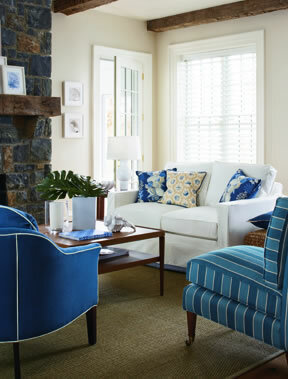 Crisply tailored chairs add a chic element, proving that "casual" doesn't have to mean sloppy. This room has the appeal of a crisp blue linen shirt with a pair of white cotton slacks — it's a seasonal look that will always be in style.